BendPak’s 10,000-lb. capacity LR-10000 low-rise lift is your solution for quick service and increased productivity when servicing today’s passenger cars and light trucks. From tire and brake service to vehicle detailing and body repair, a wide variety of vehicles will fit. When you need to get wheel service done quickly, there’s no substitute for the LR-​10000. This amazingly efficient low-rise lift holds up to 10,000 lbs. It’s perfect for trucks and SUVs that many other lifts can’t handle. Lug nuts and other small parts are always within reach with the convenient built-in storage trays. A small footprint, easy installation and adaptable 110V/220V power-unit make the LR-​10000 the perfect lift that fits any shop. 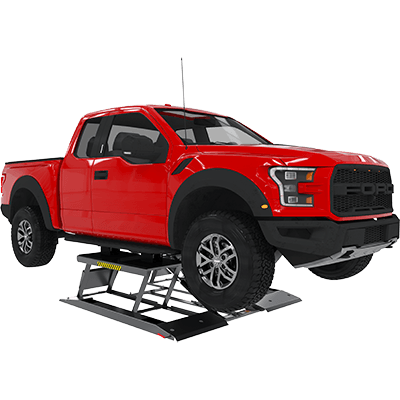 The lift platform and auxiliary adapters allow lifting of most unibody and frame contact undercarriages at recommended manufacturer pick-up points on most vehicles. A low 4" collapsed height accommodates most vehicles, including sports cars, race cars and larger trucks/SUVs. The minimal garage footprint means you can collapse your car lift without it getting in your way. This is perfect for home garages that want to reduce clutter in a tight space. If you're going to do heavy lifting, you need a solid base. BendPak steel is manufactured under the strictest industry standards. The same warranty that applies to our larger lifts applies to our low-rise lifts. A durable, leak-proof hydraulic cylinder with flow divider ensures even ascents and descents with every use. This is the same cylinder technology that supports all BendPak lift designs. In our minds, low-rise lifts deserve the same rugged equipment as any other car lift, so we treat them that way. Others charge extra for these necessary adapters, but they're standard with every low-rise lift purchase you make. There’s no point in having you open your car lift installed without all the pieces needed to operate it, is there? Only use BendPak’s durable treaded rubber lift blocks when operating our low-rise lifts. They’re more supportive and longer-lasting than many competing lift blocks. In fact, some companies use dinky rubber padding on their low-rise lifts, which rips and tears during use. Hardly a good idea. *Not all BendPak lift models meet the standards as prescribed by ANSI/ALI ALCTV-201​7 or ANSI/UL 201. Consult www.autolift.org for complete listings or contact BendPak via contact@bendpak.com.